Front-engine, grand-touring machines have a fairly specific pecking order, and the 599 is already on top, trumping most of its competitors in power, handling and looks. 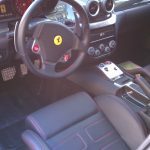 This 2010 Ferrari painted Nero Black with black leather interior, highlighted with red stitching and carbon fiber accents was recently at Concours Auto Salon. 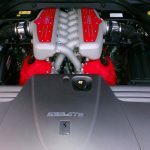 Standard features for this 599 are a 4 Cam 12 cylinder power plant producing 611 hp! Transmission is the F1 super fast sequential 6 speed. Carbon ceramic brakes are used to slow this Prancing stallion. 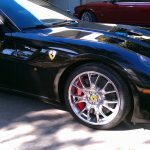 Additional upgrades provided by the factory are red calipers polished challenge rims and a Bose HiFi sound system. To see touch and feel this beautiful Ferrari in person is a treat to say the least. 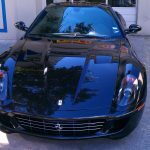 The owner brought us the 599 looking to have it protected with Paint Protection Film (clear bra) window film and give the paint a top notch polish. Xpel Premium Paint protection Film was applied to the entire front bumper with an Xpel’s bikini kit applied to the fenders and hood. We also applied Paint Protection Film to the lower rockers, wheel openings and door edges. We installed Johnson window tint to the side glass as well as a one piece installation to the back window. 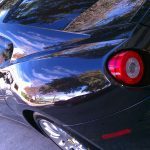 The final step for the Ferrari was to have the paint polished. We preformed a three step process to remove scratches and residual sanding marks left behind by the Ferrari Factory. 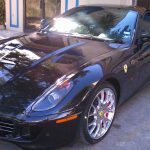 Concours Auto Salon San Antonio truly appreciates the opportunity to provide our services to the owner of this fine vehicle.